Posted on Fri, Feb 10, 2012 : 11 a.m.
Today's Frugal Floozie Friday feature is Haifa Falafel, a friendly and welcoming restaurant offering "Mediterranean cuisine made the Haifa way." Several of the salads and sandwiches cost less than our mandatory $5 period, let alone $5 per person. 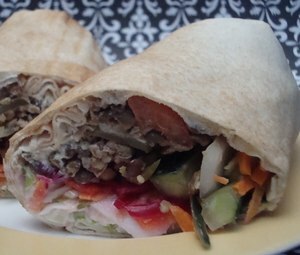 It was difficult to choose among the variety, from a pita burger to traditional falafal to chicken shawarma. But I was in the mood for something unique and different, so I ordered the Majadara Sandwich for $4.82, which offered nutritious lentils and caramelized onions. Sandwiches also come with a tremendous variety of accompaniments: tahini, hummus, garlic spread, Haifa sauce, tomatoes, onion, cucumbers, pickles, cabbage, lettuce and carrots... whew! Each bite brought different flavors and textures; it was crisp, salty, spicy, vibrant, sweet, crunchy and exceptionally good! The sandwich was absolutely enormous, and could easily have been halved and shared with someone else. (As it was, I ate half for dinner and then saved the rest for breakfast the next day; it was fabulous both times.) If sharing the meal, you could also buy a couple of the lovely desserts — baklava, rice pudding or mahalabia (milk pudding) — for $2.50 each and still stay within our budget. For a quick, nutritious meal at a Frugal Floozie Friday price, I highly recommend Haifa Falafel! Sat, Feb 11, 2012 : 1:22 a.m. I see an earlier comment regarding their Health Dept. inspections was removed. At their last inspection on 9/7/11 they had 14 Health Dept. violations, 3 of them critical. See <a href="http://www.swordsolutions.com/inspections/pgeSearchRest.asp?Hit=DirectSearch&LastCty=28" rel='nofollow'>http://www.swordsolutions.com/inspections/pgeSearchRest.asp?Hit=DirectSearch&amp;LastCty=28</a> for details (for ease of access, just enter their license # 061524 in the appropriate box; no need to choose county if you do this). Sat, Feb 11, 2012 : 2:55 a.m.
You are both welcome. Unfortunately, Roadman, not all of the eateries in the state are accessible through that link. Lenawee County, for example, is not accessible through that link. Also, other nonrestaurant eateries are not inspected by the Health Dept but by the MI Dept. of Agriculture. All grocery stores, convenience stores, and most bakeries that are mainly retail sale are inspected by the Michigan Department of Agriculture. You can contact MDA at 1-800-292-3939 for more information about their inspection reports (per Kristen Schweighoefer, Washtenaw Cty. Health Dept.). Sat, Feb 11, 2012 : 2:42 a.m. Sat, Feb 11, 2012 : 2:06 a.m. Thanks for the link. That website can access all eateries in the state. Fri, Feb 10, 2012 : 10:46 p.m. If one plans on becoming a frequent habituee, don't neglect to ask for one of their sandwich club cards which get stamped each time you come in.. .then the 8th sandwich is free. Thu, Feb 16, 2012 : 4:45 p.m.
Also, the same card has separate spots for multiple purchases of combos and large sides in addition to the sandwiches. In each instance, if you buy 8, you get the 9th free. E.g., one line is for sandwiches--buy 8 sandwiches and the 9th one is free--if you fill up the other lines, you get the 9th combo or 9th large side free. They will let you combine multiple cards if you have enough purchases on each separate card that add up to 8 on all of them put together. Fri, Feb 10, 2012 : 10:23 p.m.
Haifa Falafel has been a reliable favorite for my family. Good food at a very good price! Fri, Feb 10, 2012 : 8:38 p.m. I've gone here several times and have had great food each visit. I especially enjoy the fattoush. Fri, Feb 10, 2012 : 6:10 p.m.
Fri, Feb 10, 2012 : 5:30 p.m.
Fri, Feb 10, 2012 : 5:07 p.m.
My husband and I stopped in at Haifa Falafel a few weeks ago at the suggestion of a friend. The Falafel sandwich was out of this world. Fri, Feb 10, 2012 : 5:01 p.m.
excellent place...and hands- down the best felafel in the area ( with amer's on church st a distant 2nd and the many others not even in sight on this particular item) .